MARQUETTE, MI – Shirley J. Lindberg, age 86, of Marquette, entered eternal life Tuesday evening, June 5, 2018, at UP Health System – Marquette, in the loving, comforting care of her family. 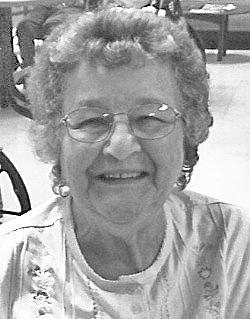 Born September 10, 1931, in Iron Mountain, a daughter of Charles and Carrie (DeFiore) Trepanier, Shirley was raised in Iron Mountain until the age of 10 when her family moved to Marquette. She was a good student and graduated from Graveraet High School, Class of 1949 and, later that year, was united in marriage to Charles G. “Skip” Lindberg on October 15, 1949. The couple were lifelong Marquette residents and raised a family of five children. For most of her life, Shirley was a homemaker who enjoyed her roles as wife, mother, and especially grandmother. For a time, she was employed as a cook at the Norlite Nursing Center, preparing nutritious meals the old fashioned way, from scratch. She was raised a devout Catholic and not only practiced her faith, but lived it. She enrolled her children in the Catholic schools and taught them the values and faith she lived by. She always worried about them and prayed for their good. When Skip suffered a debilitating stroke which left him completely paralyzed, Shirley became his primary caregiver. For 20 years, she lovingly fed, cared for, and pushed his wheelchair, so that he was kept a part of family and community events. Those years were often filled with struggle, but with faith, devotion, and determination, Shirley kept her Skip “in sickness and in health, until death.” Throughout the years, Shirley met the challenges of life in her loving, giving, and caring way. She did what had to be done and moved on. In her leisure moments, she treasured time spent with family (oh, those grandkids! ), liked to knit, and enjoyed cooking, a vigorous BINGO game, trips to the casino, and going out to eat. She was a lifelong member of St. Peter Cathedral. Shirley is survived by her children, Mary (Jerry) Henthorne, Tim (Diane) Lindberg, and Larry (Shannon Carter) Lindberg all of Marquette; daughter-in-law, Patricia Lindberg of Marshall; son-in-law, William Zintman of Harvey; her grandchildren, Melissa Doucette, Dan Campbell, Brianna (Andy) Hoffman, Tom (Cassie) Lindberg, Scott Lindberg, Kate (Jake) Cosens, Allyssa (fiance, Brady) Lindberg, Drew Lindberg; step-grandchildren, Erin Christian, Melissa Rodriguez, and Christopher Henthorne; numerous great-grandchildren; sister-in-law, Jeanette Trepanier Tully of Apache Junction, AZ; numerous nieces and nephews. In addition to her parents, Charles and Carrie Trepanier; Shirley was preceded in death by her husband, Charles “Skip” in 2002; a daughter, Yvonne Zintman; a son, Wayne Lindberg; brothers, Wayne (the late Joan “JoJo”) Trepanier, Donald (the late Shirley and Sheri) Trepanier, and Henry “Hank” Trepanier; her in-laws, Milton and Anne Lindberg, Milton and Ruth Lindberg, and Jean Iris Haley LaVigne. The family will receive relatives and friends in the Bishop’s Room located at St. Peter Cathedral on Friday, June 8, beginning at 11:00 am. A Mass of Christian Burial will be celebrated in St. Peter Cathedral at 1:00 pm with Rev. Msgr. Michael Steber, pastor, as celebrant. A reception will follow in Cathedral Hall. Interment will be made in the Holy Cross Cemetery. Escorts will be Tim Lindberg, Larry Lindberg, Drew Lindberg, Bradyn Hoffman, Jerry Henthorne, and Dan Lindberg. Honorary escorts will be Bruce Lindberg and Dan Campbell. The Fassbender Funeral Home is serving the family.